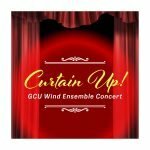 Grand Canyon University’s College of Fine Arts and Production invites you to vibrant celebration of fun-filled music, featuring the Grand Canyon University Wind Ensemble. This event is perfect to share with friends and family! Join GCU’s director of bands, GCU Wind Ensemble, Thundering Heard Pep Band and students from Music Education for an unforgettable evening.